The development of swords in China is well documented, and the evolution of the design is clear. The earliest swords from the period were actually made of stone, used in prehistoric times. Then, during the Shang Dynasty (1600 BC to 1046 BC), the first bronze workings led to the development of rudimentary metal weapons. During the Warring States period of the Zhou Dynasty (1045 BC to 256 BC), these weapons were short, one-handed double-edged straight swords made of bronze. These were extended during the Qin Dynasty (221 BC to 207 BC) and also made into a two-handed weapon. 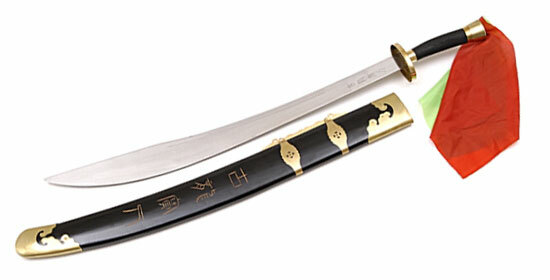 During the Han Dynasty (206 BC to 220 AD) the first single-edged weapons were created, as were steel blades. This new design was maintained until the Song Dynasty (960 AD to 1279 AD) with very few adjustments short of ridges along the blade. During the Yuan Dynasty (1279 AD to 1368 AD), the Turko-Mongol sabre was introduced as the main weapon for both civilians and soldiers. This shape became the foundation for the Liuyedao (Willow Leaf Sword) and the Yanmaodao (Goosequill Sword) of the later dynasties. 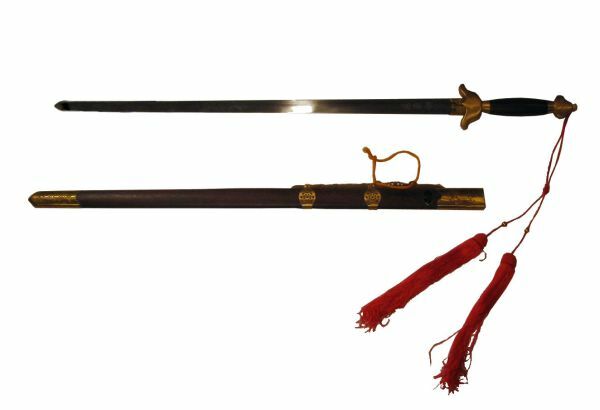 Finally, in the late Qing Dynasty (1644 AD to 1911 AD), the familiar Niuweidao or Oxtail Sword was developed. A single-handed, single-edged sabre with a heavy blade with a flaring tip, it was never issued to the military and was solely a civilian weapon for self-defence. 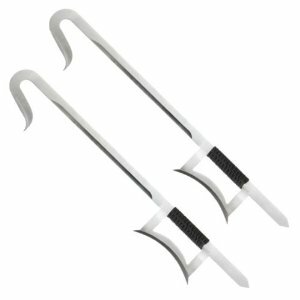 This entry was posted in Swords and tagged Butterfly swords, Chinese swords, Dao, Hook swords, Jian, Song sword, Yanmaodao. Bookmark the permalink.